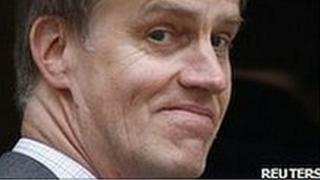 A woman stabbed Labour MP Stephen Timms twice at a constituency surgery in revenge for his vote for the Iraq war, the Old Bailey has heard. The Labour MP for East Ham said he thought Roshonara Choudhry wanted to shake hands when she smiled before lunging at him in Newham on 14 May. Miss Choudhry told police she wanted "to get revenge for the people of Iraq", prosecutors said. The 21-year-old is accused of attempted murder and having an offensive weapon. Prosecutor William Boyce QC said Mr Timms was sent "reeling and staggering" by the attack at the community centre in Beckton. His assistant Andrew Bazeley prised the kitchen knife from Miss Choudhry, who was restrained by a security guard until police officers arrived. Jurors were told Miss Choudhry had made an appointment for 2.45pm, specifically to see Mr Timms rather than an assistant, and was the second person he saw that day, just after 3pm. The MP told the court that when she came in she didn't sit down and continued walking towards him. He said: "She looked friendly. She was smiling, if I remember rightly" before she "lunged at me with her right hand". "I think I knew that I had been stabbed although I didn't feel anything and I can't recall actually seeing a knife but I think I said 'She has a knife' or words to that effect." He said he went into the toilets and lifted up his jumper to see "quite a lot of blood" and realised he had been stabbed. Mr Boyce said Miss Choudhry had told police she made the appointment to see him specifically and solely for the purpose of attacking him. She had brought with her two knives instead of one in case one broke during the attack. "She gave her intention as being an intention to kill Mr Timms, and that she was acting in that way as an act of punishment towards him for his parliamentary vote in favour of the war in Iraq," he said. Det Insp Simon Dobinson told the court that the next day Miss Choudhry told him: "I purposefully walked round the side of the desk so I could get close to him. "Then I pulled the knife out of my bag and I hit him in the stomach with it. "I was trying to kill him because he wanted to invade Iraq." Jeremy Dein QC, defending Miss Choudhry, said she did not recognise the jurisdiction of the court and did not wish her lawyers to challenge evidence put before the jury. Mr Justice Cooke explained to jurors that it was Miss Choudhry's right not to attend the trial. "The trial will proceed in her absence but you must not assume she is guilty because she is not here and you must not hold it against her," he said. The case was adjourned until Tuesday when the judge is expected to sum up.